Expertly crafted from pure, natural and organic plant extracts to soothe and soften your skin. Everyone loves to be touchable. 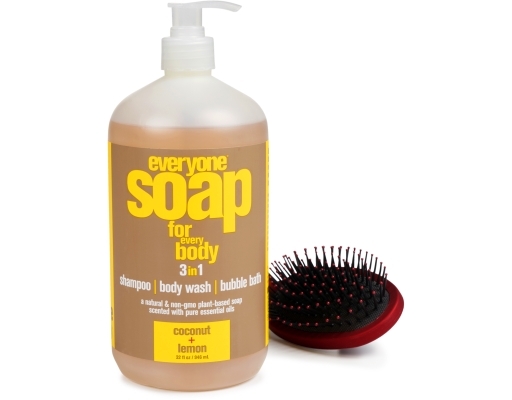 This multi-tasking soap is formulated to be used as shampoo, body wash, and bubble bath. 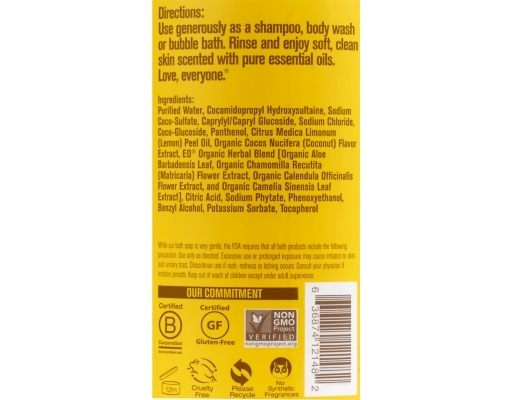 Blended with luxurious Coconut, bright Lemon essential oil awakens skin and transports the senses. Plant derived cleansers and botanical extracts create a skin-nourishing, foamy lather. 32 fl oz, generously sized for the whole family in recycled bottle. 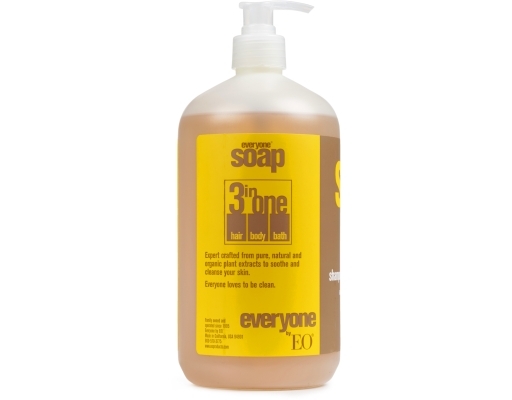 Versatile Everyone 3-in-1 Soaps are formulated to work as hard as you do. They can be used as shampoo, shower gel, bubble bath, and shave gel. They're fun, affordable Soaps made with real plant extracts and scented with pure essential oils. 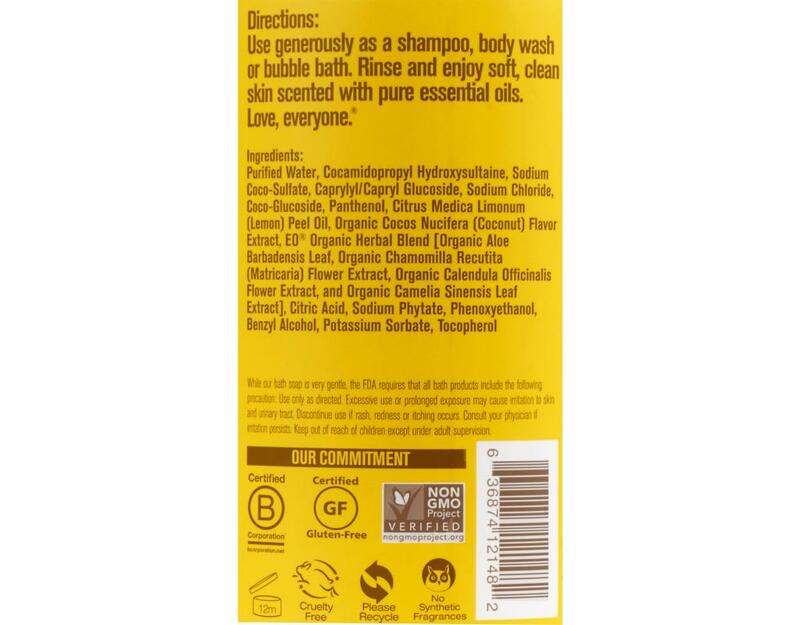 Certified non-GMO, gluten free, cruelty free, and synthetic fragrance free. The formulas start with Coconut-derived cleansers, Vitamins B5 and E, and signature EO Organic Herbal Blend of Aloe, Calendula, Chamomile, and White Tea extracts to cleanse, fortify, and moisturize your skin. Each 3in1 Soap has a specialized blend of essential oils formulated to uplift your mood and leave you smelling great. 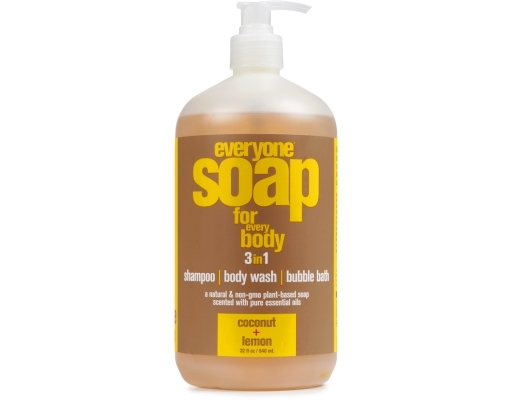 Everyone 3-in-1 soaps are great for more than your hair and body. They’re also perfectly formulated to be an extra bubbly bubble bath and a smooth, conditioning shave gel. Because of the plant based, non-GMO ingredients, these incredible soaps are great for camping. They don’t harm the planet when they get washed off, they’re even gentle on septic systems.